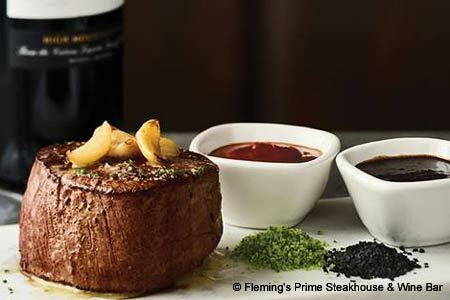 Terrific steaks, good wines, and professional service at Fleming's. : Consistently tasty steaks and professional service are hallmarks at Fleming’s, where a glass of red wine and a 20-ounce Prime bone-in New York strip pretty much fit the bill when you've got a hankering for red meat. And this is the place to satisfy the urge, with USDA Prime beef, hand-cut daily. The appetizers are ho-hum, and we could almost skip the red meat and just order the decadent sides: blue-cheese mashed potatoes, grilled asparagus, and chipotle cheddar mac ‘n’ cheese. The trouble is, the steaks are so big and filling, the sides get dismissed. So share a couple and order your favorite cut of meat: a filet mignon, rib-eye or New York strip. (Prime rib is served Sundays only.) You could opt for veal, pork or chicken, and the wild Alaskan salmon with Cabernet butter sauce is as good as any cut of red meat. The contemporary dining room features a swanky bar off to the side near the entrance, serving lots of martinis and more than 100 wines by the glass. There's also a reserve list of 80 wines.